It’s a holiday weekend—Happy Fourth!—the perfect time for a little DIY project. This one is easy, cheap, fairly quick, and it solved a major furnishing problem in our living room. One you couldn’t really see when I showed off my window treatments. It dealt with our tv stand. Our old one didn’t fit in the new house and, yadda yadda yadda, we needed a new one. So, everybody got your pallet? Let’s begin. This puppy was just sitting in our newly acquired garage begging for a makeover. I had about 20 pallet projects on my list of “future ideas”, but unfortunately none of them was a tv stand. Wah wah. So I searched around online and found these for sale. I figured, how hard could these be to make? I had a plan that made sense in my head, which of course meant nothing in the real-world-of-things-happening. But I figured it was worth a try since I’d have to spend $0 on materials. First, the removal of rusty nails. There were only a few. And the one board on the “wrong” side of my single-sided pallet. Next up, sanding. Which is so much easier with a) an electric sander and b) room in which to sand. Having these two things has made a huge difference in my DIY project world. It took a lot of sanding to get the wood to a smoothness I liked. I used a really rough sandpaper and just kept going. The next step involved the hubs, AKA Saw Man, because I needed this big pallet in two pieces. Each piece is about 20.5″ deep to accomodate our living room corner. The width of the pallet was 38.5″, which was perfect…lucky break. So then came stain. Something I initially wanted to just purchase at the hardware store and apply as usual, but after getting involved in Perinnial, a non-profit organization in St. louis focused on using found and natural materials to make new things, I was inspired to do something different. More “natural”. And luckily I’d saved a natural stain recipe found a few months back…it was just too cool to pass up! It involved used coffee grounds, vinegar, and a piece of steel wool. I know, it sounds nuts. Stu saw it sitting on the kitchen counter and exclaimed “What is that?? !” It did look gross. All sloshy and brown in a sealed jar. Since I didn’t have any plain steel wool and apparently the grocery stores don’t sell it, I washed all the soap out of a SOS pad and threw it in the jar. As for measurements, I didn’t measure. After it stewed for a couple days, I started painting it on with the steel wool. That worked but a paint brush worked better and had the same results. A wet, old coffee water smelling, dirty looking pallet. To my shock and awe, the stain worked. I achieved the exact weathered-wood look I had envisioned. And it was, again, FREE. Total expense to this point: $0. But then I had a little purchase to make. Something we’ve actually needed for a long time. I found this one at “Big Orange” and thought it would do the trick. There were more expensive options, name brands that I’d heard of before, but I decided this one fit the bill. Online it’s listed as $39.99 but I may have found it on sale…I don’t remember it even being that much. Anyway, I couldn’t wait to get to work when I got home. Seriously, as soon as Ethan’s head hit the pillow (or, in his case, a giant stuffed shark) I was out on the porch getting ready to drill. Stu was out of town and I was determined to figure this out on my own! I used the jig to drill pocket holes that would connect the top and bottom pieces without any ugly screws drilled at wonky angles. The jig learning curve was about two minutes and before I knew it, there a finished “top” to our tv stand. And it was solid…no rickety business going on. I don’t have a good depiction of the connection…sorry. Luckily, my hair pin legs arrived just a couple days after my jig-skills were put to use. This was the look I had in my head and what do you know, I was able to find exactly the legs I’d imagined. A very nice man sell these legs for very reasonable prices here, and we couldn’t be happer with his work. 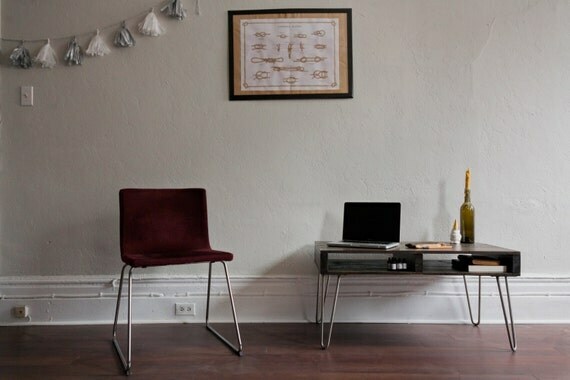 These 16″ brushed metal legs were the only money spent during this project. $59.99 for four legs (the price has gone up a little since I bought mine), that includes shipping. The seller even included screws and tiny plastic covers to protect our wood floors. With the legs attached, the height came to 24″—just tall enough for great viewing from our couch and just low enough to minimize the obnoxious size of our tv. The finished product was just as we’d hoped. Everything from the rough-match of the two pieces, stamps, and knots are exactly what we were going for. Industrial but the stain adds a warmth to the wood. It looks great under our giant tv. We’re lucky our numerous boxes fit in the openings…the DVD player actually didn’t fit in the left side, but I let out a yelp of excitement when it fit on the right. Something of which I was aware during construction, but I was sold on the idea and figured we’d work something out. So that’s it. A very cheap, custom fit version of what we wanted. It’s not all lacquered and perfect, but I’m pretty sure that’s why we love it so much. We’re also pretty pumped about the reduce-reuse-recycle aspect of the project…even our stain used old stuff! Right after finishing this we made our pallet planter for the back yard. That means my pallet project count = 2. It looks even better in person! Keep inspiring, Beck! The TV stand project came out great! Didn’t even know there was such a thing as homemade stain, what a neat idea. Thanks Chris! I had no idea homemade stains a) existed and b) worked. It was so easy! 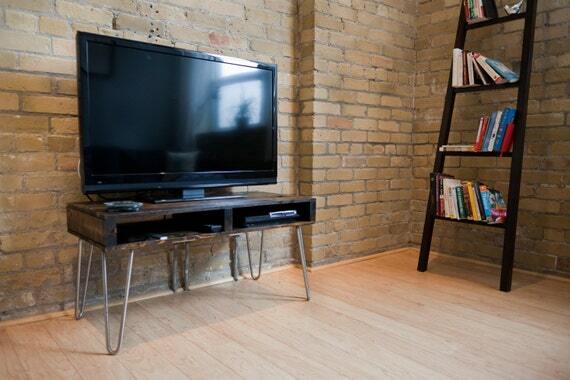 Hye……..thanks for sharing this pallet tv stand……i like pallet furniture. again a big thanks. I love this and want to copy it! Can I ask how big your TV is (the width)? I like the slight overhang that yours has and want to see if mine would be similar. Thanks! Sorry to take so long responding! Had to remember to measure the TV. I think it’s a 48″ tv, but I also measured the width and it’s 45″. Hope this helps! Good luck! It was really easy.